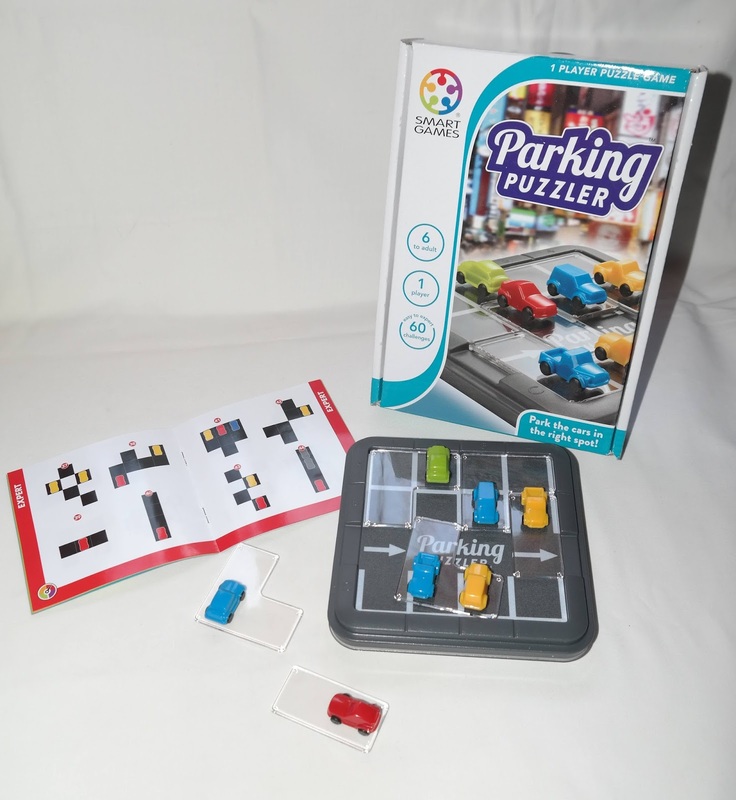 The Parking Puzzler comes packaged with SmartGames' newest box design, which to me are much more practical and environment-friendly. The smaller size box means you can easily take it with you on your travels and make the journey a little more fun. I really like the style of the game, with the clear pieces adding a touch of class and sophistication to the sleek design. The cars are the perfect size and are glued to the pieces, so even a small child can play with it (the box says 6 to adult, so keep that in mind). 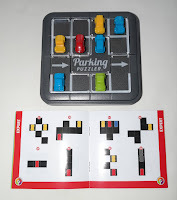 This game works like a traditional packing puzzle, so if you're familiar with those you're already halfway there to understand the mechanics of it. 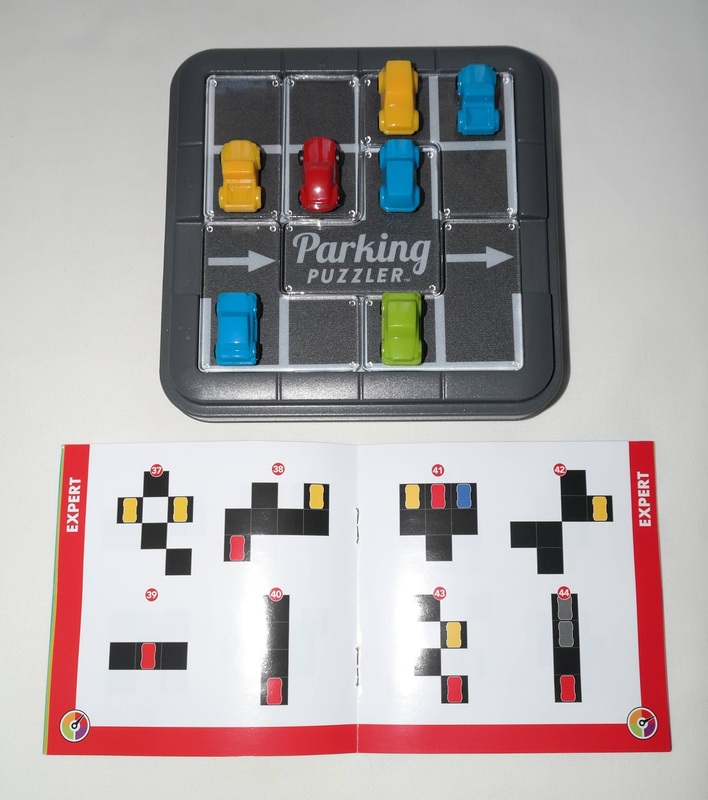 There are six pieces (two straight ones and four L-shaped ones), each of them having one or two cars attached to them. Actually, only one of the pieces has two cars attached to it. 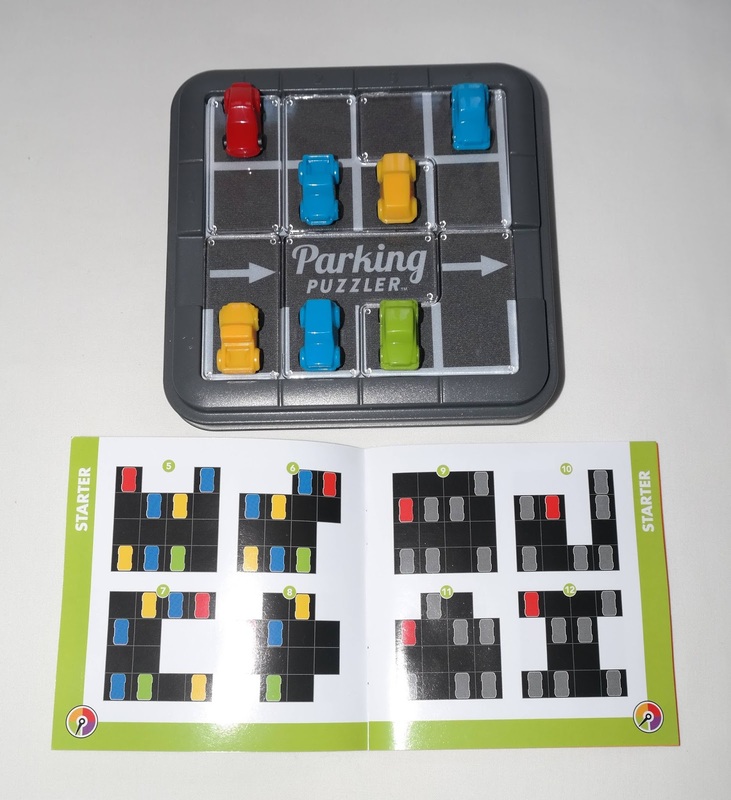 The game board is comprised of a 4x4 grid, with 12 of the 16 spaces used for "parking" the cars. 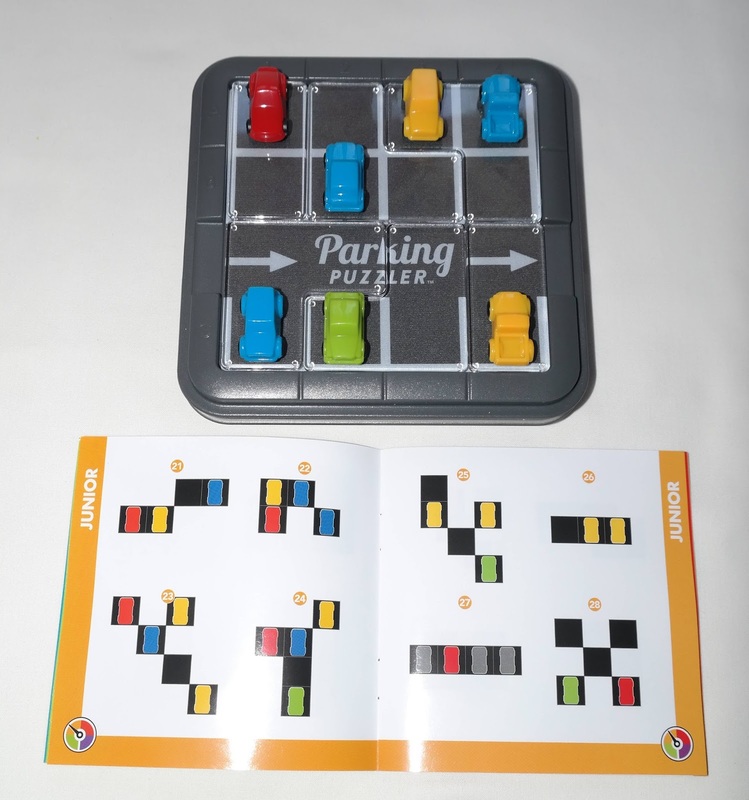 A horizontal line is used as a drive way or an access lane to the parking lot, so no cars can occupy those spaces when you're solving any of the provided 60 challenges. So how does the game work? 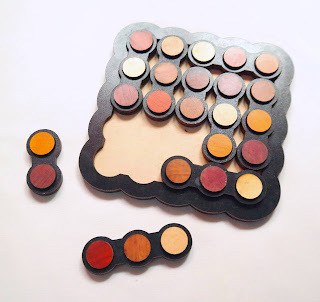 Simple: just choose any of the 60 challenges, which are divided into four different difficulty levels, and place the six pieces in a way that it completely matches the positions and colors seen in that particular challenge. All cars have to be in the vertical orientation, so the pieces can only be placed in two directions instead of the usual four. As you progress through the difficulty levels, the hints in the challenges also become more ambiguous. 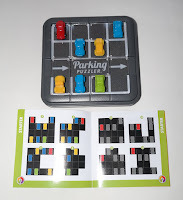 Grey cars will show only their position on the parking lot, but not the actual color. You'll have to figure that out for yourself. Black squares mean you can't have any cars on that particular space. Also, many of the later challenges only show part of the game board, so you have to work out which part it is, since it doesn't show the entire grid. There's only one possible solution for each challenge, so only when you have matched exactly what is shown in the challenge will you have solved it. The later challenges are quite tough to solve, mainly because they don't show the entire grid. You think you're doing great and you worked out where the pieces should be, only to find out later that the pieces can't be placed on that space, so you have to shift your thinking and start again. It's a really difficult game and that will satisfy and reward anyone looking for a challenge. This game was a pleasant surprise, from the moment I unpacked it, to the moment when I finally solved a particular difficult challenge that was bugging me for a while. Everything about it was cleverly designed to make your brain think in different ways and challenge you to your absolute best. 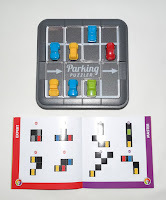 This is a must-have and a perfect gift for anyone who likes a good packing puzzle. 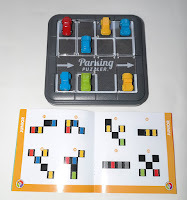 Availabilty: Amazon is your best bet if you want to find the Parking Puzzler or any other by SmartGames. If you like both wooden puzzles and Sudoku puzzles, you're in for a treat, as Jean Claude Constantin makes yet another great-looking puzzle that promises not to disappoint fans of either category. Sudoku Bunt takes the basic idea of Sudoku and turns it into a beautiful puzzle by twisting the rules a little bit. The result may not be for everyone, as this takes more or less a trial and error approach, but the high difficulty level should keep you intrigued enough to keep trying, or at least keep you busy. The puzzle is beautifully made with five different actual wood colors, not painted wood. Nine different pieces make up the total of 25 wooden chips joined in groups of two and three units each. It's made of laser-cut wood, which makes the puzzle lighter and of course, much more affordable.It measures 13.5cm in diameter (5.3"). This type of puzzles, seen in countless versions by now, are based on the original design by Mcloughlin Bros, known as The Giant Puzzle, which was invented in 1888. The goal is simple: on a 5x5 grid there should be a different color in each of the rows and columns. No repeating colors shall appear in any of the rows or columns. By order of elimination, the diagonals will have a unique color in each space as well. 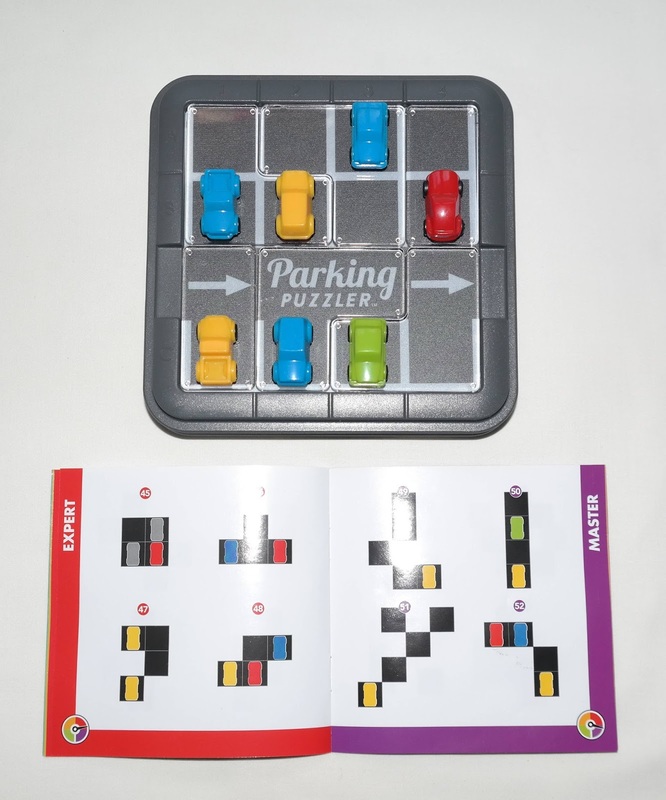 The goal would be fairly simple if the pieces were individual colors, like the original puzzle. In fact, the solution is pretty straightforward once you understand the logic. In Sudoku Bunt's case however, that logic is thrown out the window because of the nature of the pieces. As you have groups of two and three colors joined together in a unique piece, the puzzle becomes much more difficult and the solution is switched from logic into trial and error. Now, if you're not that good at puzzles, this is good news for you, since you'd be in the same playing field as an experienced puzzler. To solve this, it's more like a stroke of luck than pure skill. The clever twist in the original concept makes this puzzle a must-have for fans of Sudoku and the classic Giant Puzzle. Even though it's a bit difficult to solve, I believe it's accessible to any level of skill. It's a gorgeous design that manages to capture the attention of any curious and puzzle-orientated minds. Availability: The Sudoku Bunt is available at Brilliant Puzzles for just $18.95 USD. There are also many other interesting designs by Constantin available.